Beamsley Lodge Guest HouseAllison & Dave will welcome you into their guesthouse,where you can relax in comfort in one of the individually decorated stylish bedrooms. Located on the sea front just 15 minutes walk from the pier and town centre, We are ideally situated to enjoy all that Eastbourne has to offer. Many of our rooms have a sea view as does the lounge/bar and breakfast room, where you can enjoy the morning sun while having a freshly cooked breakfast. We also offer a variety of cereals, fresh fruit salad and yogurts. Check-in is from 16.00pm until 19.00pm please, unless by prior arrangement with us. All our rooms have wall mounted flat screens TV's with built in Freeview & DVD/CD players. Beamsley Lodge sometimes limits bookings to 3 or more days. Located on the first floor this room is large light and airy with a large bay window decorated in calming and relaxing shades of beige. The room itself and shower room have both recently been fully refurbished. Sea views. King size bed. Rm 102 Lge Dbl sometimes limits bookings to 3 or more days. 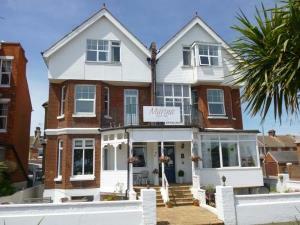 Large twin room on the ground floor, recently refurbished room and shower room. Light and airy. Rm 2 gr fl sometimes limits bookings to 3 or more days. Large and airy ground floor double room. Recently refurbished bathroom and recently redecorated room. Double aspect bay window enjoying both the morning and evening sun. Rm 3 gr fl sometimes limits bookings to 3 or more days. Allison & Dave will welcome you into their guesthouse,where you can relax in comfort in one of the individually decorated stylish bedrooms. Located on the sea front just 15 minutes walk from the pier and town centre, We are ideally situated to enjoy all that Eastbourne has to offer. Wall mounted flat screen tv in all rooms with Freeview. Secure cycle storage on request. Parking in private carpark bookable in advance £5 per night charge. Takeaway breakfast available for early starts/departures, 24 hours notice required. Children welcome from age 12. Located on the corner of Royal Parade and Beamsly Road (A2021) a direct road to A27/A22. Bus stop directly outside property from train station, town centre and Hastings. Eastbourne train station 15min walk away, 5 mins by taxi. Our ground floor rooms are ideal for those with limited mobility, but not permanently in a wheelchair, and are not suitable for electric wheelchairs. Unfortunately we do not have storage/charging facilities for mobility scooters.